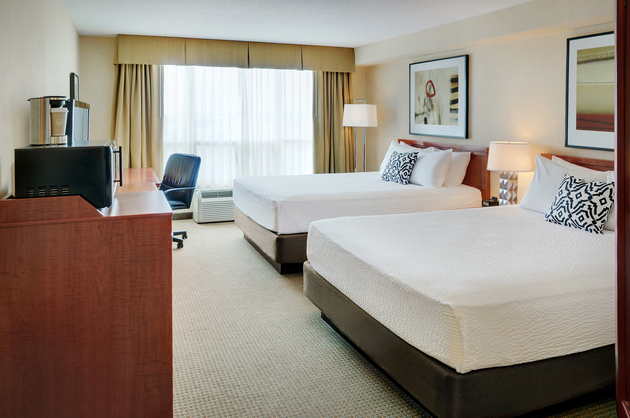 Located near highways 8 and 401, Radisson Hotel Kitchener Waterloo offers easy access to the vibrant Kitchener, Cambridge and Waterloo area, known for its many thriving tech companies. Shop for antiques or fresh produce in quaint St. Jacobs Country, and tour nearby schools like the University of Waterloo, Wilfrid Laurier University and Conestoga College. Business travellers appreciate easy access to SunLife, Economical Insurance, Communitech, Google and Christie Digital, and Region of Waterloo International Airport (YKF) is just seven minutes away. Our hotel also offers the opportunity to support local charities during your stay. Make your corporate or government travel easier by reserving one of our Business Class Rooms. Enjoy upgraded amenities such as a complimentary breakfast each morning and a drink voucher each evening. Sample the Waterloo region’s eclectic cuisine without leaving the hotel by visiting our four on-site restaurants. Start your day with bacon, eggs and homemade waffles at the Lobby Café, or order room service to enjoy breakfast in bed. Business travellers can schedule a lunch with clients at Charcoal Steakhouse, which offers a Power Lunch menu filled with light, refreshing salads and sandwiches. Return to the restaurant at dinnertime to linger over Canadian AAA steaks and seasonal seafood. If you’re craving Italian flavours, dine on homemade pasta, hand-tossed pizza and perfectly cooked chicken at dels Enoteca Pizzeria. This casual venue also offers imported Italian beers, speciality cocktails and wine on tap. Martini's, our inviting bar, serves expertly mixed drinks and elevated pub food. Try a burger made from local beef and topped with Gorgonzola and prosciutto, or share a plate of crispy calamari with friends. Bingemans – Located just 10 minutes from the hotel, Bingemans features a water park, an arcade and a bowling alley. In addition to retro games, the FunworX arcade offers the region’s largest indoor playground. Hosting an event? Bingemans Conference Centre accommodates up to 1,200 guests. Waterloo Region Museum – Drive about 10 minutes from the hotel to tour the largest community museum in Ontario. The main gallery explores the history of the Waterloo region, and the feature gallery hosts rotating visiting exhibits. The museum is also the entrance to the Doon Heritage Village, a living history village that reveals what life was like for Waterloo residents in 1914. St. Jacobs Country – Known for its rich Mennonite heritage and its quaint old-fashioned villages, St. Jacobs Country is a historical landmark just 20 minutes from the hotel. This charming area is filled with boutiques, cafés, museums and spas. The farmers' market offers fresh produce, a bounty of artwork, and pony and trolley rides. Our four contemporary meeting rooms provide audiovisual equipment, ergonomic chairs and free high-speed, wireless Internet for your business conference or sports team meeting. Planning a wedding ceremony or reception? We offer colourful table linens, catering and assistance from our experienced staff to help you create the celebration you’ve been waiting for all your life.